It was a tough decision deciding whether to post this one or not. In this video Dean Potter takes his dog Whisper BASE jumping. One thing WAS clear for me. This is NOT OK.
You don’t have a right to put a dog’s life in danger just because you choose to do so with your own life. Clearly Whisper would do ANYTHING to please her owner. And I’m sure she wants to be with Dean all the time no matter what it is he’s doing. But she obviously isn’t capable of comprehending the danger. As her guardian that’s YOUR job Dean. And she clearly trusts you to do it. Dogs are magnificent that way. But this is an abuse of that blind and beautiful canine trust. Dean, you do realize she WOULD willingly die for you don’t you? The thing is, she shouldn’t have too. Yes, it went fine. Yes, probably 99 out of a 100 times it will. But it’s still not okay. So yeah, I do have some ethical issues with this. That said, it’s fascinating to watch. 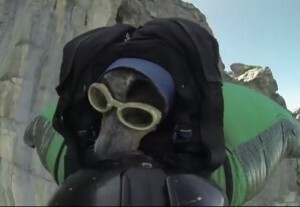 And as most BASE jumping videos are, it’s really beautiful. And then there’s the thoughtful… yet maddening… commentary. It’s kind of impossible to not like Dean a little bit. He clearly loves Whisper. I’m sure he really did agonize over whether or not he was making the right decision. And in my live-and-let-live view of the world I feel like I should probably climb down off my soapbox and shut the h*ll up. But the truth is Dean didn’t NEED to agonize. There was no real reason to put Whisper in this danger. Her life was not enriched by BASE jumping. In the end it was a selfish act.